Not to be confused with Chesapeake Bay Bridge–Tunnel. "Bay Bridge", "Maryland Bay Bridge","America's Scariest Bridge"
The Chesapeake Bay Bridge (known locally as the "Bay Bridge") is a major dual-span bridge in the U.S. state of Maryland. Spanning the Chesapeake Bay, it connects the state's rural Eastern Shore region with the urban Western Shore. The original span, opened in 1952 and with a length of 4.3 miles (6.9 km), was the world's longest continuous over-water steel structure. The parallel span was added in 1973. The bridge is officially named the "Gov. William Preston Lane Jr. Memorial Bridge" after William Preston Lane Jr. who, as the 52nd Governor of Maryland, initiated its construction in the late 1940s finally after decades of political indecision and public controversy. The bridge is part of U.S. Route 50 (US 50) and US 301, and serves as a vital link in both routes. 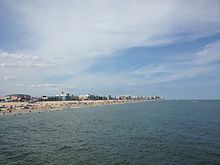 As part of cross-country US 50, it connects the Baltimore-Washington Metropolitan Area with Ocean City, Maryland, Rehoboth Beach, Delaware, and other coastal tourist resort destinations. 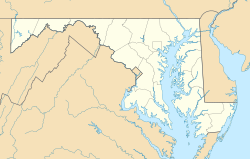 As part of US 301, it serves as part of an alternative route for Interstate 95 travelers, between northern Delaware and the Washington, D.C., area. Because of this linkage, the bridge is busy and has become known as a point of traffic congestion, particularly during peak hours and summer months. Ferries were used as the main mode of transportation across the bay from the colonial period until the completion of the 1952 bridge. The first service ran from Annapolis to Broad Creek on Kent Island, roughly where the bridge is today. In 1919, the Claiborne–Annapolis Ferry Company began running ferries between Annapolis and Claiborne, a community near St. Michaels. In July 1930, the Claiborne–Annapolis Company added a new ferry route, one running from Annapolis to Matapeake, a significantly shorter distance. The auto and passenger ferries were taken over by the State Roads Commission in 1941 (reorganized into today's State Highway Administration of the Maryland Department of Transportation in 1973). Two years later the commission moved the western terminus of the old Annapolis–Matapeake ferry to Sandy Point (later adjacent to Sandy Point State Park), shortening the cross-bay trip. A 1938 proposal by the Maryland General Assembly was the first to call for a bridge at the Sandy Point–Kent Island location. Although the legislation authorizing the new bridge passed, the involvement of the United States in World War II delayed the bridge's construction. In 1947, with the war over, the Assembly, under the leadership of Maryland Governor William Preston Lane Jr., (1892–1967), passed legislation directing the old State Roads Commission to begin construction. Ground was broken in January 1949, and after a ​3 1⁄2-year construction project, the bridge opened to traffic on July 30, 1952, as both the longest continuous over-water steel structure, and the third longest bridge in the world. Before the opening, a parade of vehicles made the first official crossing, led by then current Governor Theodore Roosevelt McKeldin, (1900–1974), and other state officials in a distinctive white Cadillac convertible flying huge American and Maryland flags. On November 9, 1967, the bridge was dedicated to Governor Lane, who had died earlier that year, and officially renamed the "William Preston Lane Jr. Memorial Bridge". The Bay Bridge during 2003's Hurricane Isabel. Police block traffic leading up to the Bay Bridge during Hurricane Isabel due to high winds. Because of its height, the narrowness of the spans (there are no hard shoulders), the low guardrails, and the frequency of high winds, it is known as one of the scariest bridges in the world,  especially in higher tractor-trailer trucks. Several incidents related to the bridge have occurred. In some cases, these have caused significant closures and traffic congestion on either side approaching the bridge. View of both spans from the Queen Anne's County side, in which the original 1952 span appears in front of the newer 1973 span. With shore-to-shore lengths of 4.33 and 4.35 miles (6.97 and 7.00 km),  the two spans of the bridge form the longest fixed water crossing in Maryland and are also among the world's longest over-water structures. The bridge's western terminus is in Sandy Point State Park, located northeast of Annapolis in Anne Arundel County, and its eastern terminus is in Stevensville on Kent Island in Queen Anne's County. The westbound span at sunset. The leftmost lane is closed to westbound traffic. Traffic patterns on the bridge's five lanes can be adjusted via its lane control system, which consists of overhead lane control signals on both spans and approaches. Typically, the two lanes on the south-most span are configured for vehicles traveling east on eastbound US 50/US 301, while the three lanes on the north-most span are configured for vehicles traveling west on westbound US 50/US 301; the spans are therefore referred to as the "eastbound span" and "westbound span", respectively. However, this pattern is adjusted during incidents or peak travel times: for instance, on the outset of weekends when there is a high volume of beach-bound traffic, one lane on the westbound span is configured for eastbound traffic. While there are no pedestrian facilities on the bridge, the Bay Bridge Walk and Governor's Bay Bridge Run used to afford an opportunity to cross the bridge on foot, usually on the first Sunday in May. The events took place on the eastbound span, which was closed to vehicles while two-way traffic shared the westbound span. Participants started on the east end of the bridge (on Kent Island) and proceeded west to the finish near the toll plaza. WMATA and MTA transit buses transported participants between outlying parking areas and the start and finish points. In the years since the bridge's completion, Ocean City (pictured) has experienced significant growth. Panoramic view of the bridge, looking south, in which the two main spans (suspension at center and through truss at left) are visible. The towers with the "X"-shaped latticework are on the eastbound (1952) suspension span, while those with the horizontal crossmembers are on the westbound (1973) suspension span. Notice the difference in the locations of the anchoring points of the main cables: at water level for the eastbound span and at deck level atop large concrete piers for the westbound span. ^ a b c d "The William Preston Lane Jr. Memorial Bridge" (PDF). Maryland Transportation Authority. Retrieved October 26, 2007. ^ Gayman, Jennifer. "Kent Island". Maryland Online Encyclopedia. Retrieved November 18, 2007. ^ "William Preston Lane Jr. Memorial Bay Bridge: Engineering Feats". baybridge.com. Archived from the original on July 1, 2008. Retrieved February 5, 2008. ^ a b "William Preston Lane Jr. Memorial Bay Bridge: History". baybridge.com. Archived from the original on July 1, 2008. Retrieved February 5, 2008. ^ "World's Scariest Bridges". Travel and Leisure. October 2010. Retrieved September 2, 2013. ^ "Don't look down! The Maryland bridge so terrifying locals pay $25 to be driven across in their own car". Daily Mail. 27 May 2013. Retrieved September 2, 2013. ^ "Hurricane Isabel photo log". Indepth:Forces of Nature. CBC News. September 18, 2003. Retrieved November 16, 2007. ^ Martin, Patrick (September 25, 2003). "US: Millions still without power a week after Hurricane Isabel". World Socialist Website. Retrieved November 16, 2007. ^ "High winds force closure of Chesapeake Bay Bridge". Delaware Online. March 6, 2013. Retrieved March 19, 2013. ^ St. George, Donna; Birnbaum, Michael (August 11, 2008). "Traffic Continues to Stall on Bay Bridge". The Washington Post. Retrieved August 11, 2008. ^ May, Adam (August 11, 2008). "Eastbound Right Lane Reopens On Bay Bridge". WJZ. Retrieved August 12, 2008. ^ Dominguez, Alex (August 27, 2008). "Bay Bridge walls had corrosion, tests show". The Free Lance-Star. Archived from the original on May 8, 2009. Retrieved August 30, 2008. ^ Legler, Dixie; Highsmith, Carol (2002). Historic Bridges of Maryland. Crownsville, Md. : Maryland Historic Trust. p. 46. ISBN 1-878399-80-2. Archived from the original on 2009-05-10. ^ "William Preston Lane Jr. Memorial Bridge: Fun Facts [Family Fun]". Maryland Transportation Authority. Archived from the original on September 28, 2007. Retrieved October 9, 2007. ^ "SAFETY TIPS for traveling the Bay Bridge". Maryland Transportation Authority. Archived from the original on December 27, 2007. Retrieved October 9, 2007. ^ Gramlich, John (July 7, 2006). "State DOTs hope drivers see dots". Stateline.Org. ^ "Plans made to enhance two-way traffic operations on Chesapeake Bay Bridge". WBAL TV. Archived from the original on June 20, 2013. Retrieved June 18, 2013. ^ Thomson, Candy. "Bay Bridge getting rumble strips, safety buffer zone". Baltimore Sun. Retrieved June 18, 2013. ^ "Toll Rates". baybridge.maryland.gov. Maryland Transportation Authority. Retrieved June 11, 2017. ^ "Toll Rates for the William Preston Lane Jr. Memorial (Bay) Bridge (US 50/301)". Maryland Transportation Authority. Retrieved July 10, 2014. ^ "WESTBOUND BAY BRIDGE TOLL ENDING". Washington Post. Feb 1, 1989. ^ "Safe Travel Tips". Maryland Transportation Authority. Archived from the original on October 6, 2009. Retrieved November 30, 2009. ^ "The 22nd Governor's Bay Bridge Run". Annapolis Striders. Archived from the original on October 27, 2007. Retrieved November 16, 2007. ^ Kozel, Scott. "Chesapeake Bay Bridge Walk". Roads to the Future. Retrieved November 16, 2007. ^ Schuyler, Jim (May 6, 2007). "High Winds Cancel Bay Bridge Walk". WJZ-TV. Archived from the original on December 27, 2007. Retrieved November 16, 2007. ^ a b Yanovits, Dave (May 7, 2007). "Race Canceled for 4th Time in Six Years". The Washington Post. Retrieved November 16, 2007. ^ "Bay Bridge Walk Canceled for 2008, 2009". WTOP News. December 6, 2007. Retrieved February 6, 2008. ^ Basch, Michelle. "Bay Bridge Walk cancelled for 4th year in a row". WTOP. Archived from the original on January 5, 2013. Retrieved March 14, 2010. ^ Eric Willison (April 14, 2015). "Bay Bridge". baybridge.com. Maryland Transportation Authority. Archived from the original on March 3, 2011. Retrieved March 31, 2011. ^ "No Bridge Walk Scheduled in 2012". Maryland Transportation Authority. Archived from the original on 2012-09-04. ^ "Just Announced: 10K Race Across the Chesapeake Bay Bridge". Delmarva Town Crier. March 27, 2013. Retrieved July 23, 2013. ^ Shatz, Jordan (April 2, 2013). "Officials say OK to bridge 10K". Retrieved July 23, 2013. ^ "McGillivray to Direct 10K Across the Bay". Running USA. July 17, 2013. Archived from the original on July 27, 2014. Retrieved July 23, 2013. ^ "Race Charity Partners". CBBR. Archived from the original on November 15, 2013. Retrieved December 5, 2013. ^ Johnson, Darragh; Hernandez, Nelson (July 30, 2002). "Spanning Half a Century". The Washington Post. Retrieved October 9, 2007. ^ "End of U.S. highway 50". August 10, 2007. Archived from the original on July 29, 2009. Retrieved November 16, 2007. ^ Anderson, Steve. "John Hanson Highway". dcroads.net. Retrieved February 6, 2008. ^ Dukes, Corey (August 1, 2007). "Abandoned US 50 / US 213, Vienna, MD". Delmarva Highways. Archived from the original on October 20, 2007. Retrieved October 9, 2007. ^ Dukes, Corey (January 19, 2004). "Ocean Gateway – Ocean City, MD to MD 90 Interchange". Delmarva Highways. Archived from the original on September 27, 2007. Retrieved October 9, 2007. ^ cahamilton@ceciwhig.com, Carl Hamilton. "Police confirm the identity of bridge jumper". Cecil Daily. ^ "One man dies, another injured in jumps from Bay Bridge". Cecil Daily. ^ "First responder saves man from suicide on bridge". WGBA. 12 April 2018. ^ http://www.washingtontimes.com, The Washington Times. "Man jumps off Chesapeake Bay Bridge in Maryland". The Washington Times. ^ "3 plunge from Bay Bridge; 2 killed". Washington Examiner. 18 April 2011. ^ Berman, Dori (June 27, 2005). "Task force says second Chesapeake Bay bridge is best option". The Baltimore Daily Record. Retrieved February 5, 2008. ^ "Meeting #2: Bridge, Traffic, and Highway Issues" (PDF). Maryland Transportation Authority. Archived from the original (pdf) on January 24, 2007. Retrieved February 5, 2008. ^ Wyatt, Kristen (August 29, 2006). "Bay Bridge Report Released without Recommendation". WTOP news. Archived from the original on January 5, 2013. Retrieved February 5, 2008. Wikimedia Commons has media related to Chesapeake Bay Bridge.